Dave is allergic to fish. Yes, I know that most Japanese joints also serve other food, but asking someone with a fish allergy to go to a sushi restaurant is like expecting a vegetarian to dine at the Salt Lick BBQ because the menu includes cole slaw and vegetarian pinto beans. It’s just not cool. Soy sauce is a big no-no. Besides all the grouchy paleo concerns (naughty legumes! ), I have thyroid issues so soy is, like, doubly no good. Do I have to say it? OK, I will. Rice! Boo! Hiss! Steamed white rice is generally pretty useless in the nutrition department, unless you need extra starch. My favorite is the California roll which always makes me feel sort of lame. It’s not raw. It’s not exotic. Is it even real sushi?! Here’s the thing: I really like the flavor and texture mélange (mélange!) of the cool, sweet seafood with creamy avocado, salty soy sauce, and the bite of wasabi. The up-the-nose rush! If we solve the problems, there’s plenty to recommend California rolls: seafood and fish are excellent protein sources. Avocado is a great way to get delicious fat. Sushi is fun to eat, and we dino-chow aficionados don’t get many opportunities to eat “fun” food. To find the answer, I first had to ditch the rice. And while I was fixing the rice problem, I decided to tackle the other annoyances, too, namely, in a traditional California roll, (1) the avocado is always in a hunk, so if you bite the piece of sushi in half (I know! I’m not supposed to, but I do…), all of the avocado is in that one mouthful, instead of equally distributed across bites; and (2) there are never enough vegetables. This makes enough for one person for a meal or two snacks – if you’re around my size. If you’re a big, CrossFit dude, this is probably just a snack or half a snack for you. Adjust as necessary. I’ve included two versions below: Mango-Shrimp Roll and Avocado-Salmon Roll to get you started. Avocado: Cut in half and remove the pit. Use a spoon to remove the fruit from the skin and slice the avocado lengthwise into thin slivers. Mango: Peel the mango, remove the pit, and cut half of it into strips lengthwise. Reserve the other half for dessert! Red pepper: Cut in half, remove stem and ribs, then slice into very thin strips lengthwise. Scallions: Cut in half to separate the dark green tops from the white, then cut the dark green tops into strips lengthwise. Cucumber: Peel, cut in half lengthwise and remove the seeds with a spoon, then cut into matchsticks. Jicama: Cut in half, peel, then cut a slice into matchsticks. Wasabi: If using, mix wasabi with water, following the package instructions, and set aside. Prep the nori: Lay a piece of nori on a rolling mat, shiny side down. With about 1/4 of the avocado, form a single layer of slices on the nori. Leave a naked 1-inch strip on the side closest to you. Use the back of a spoon to spread the avocado across the surface of the nori. 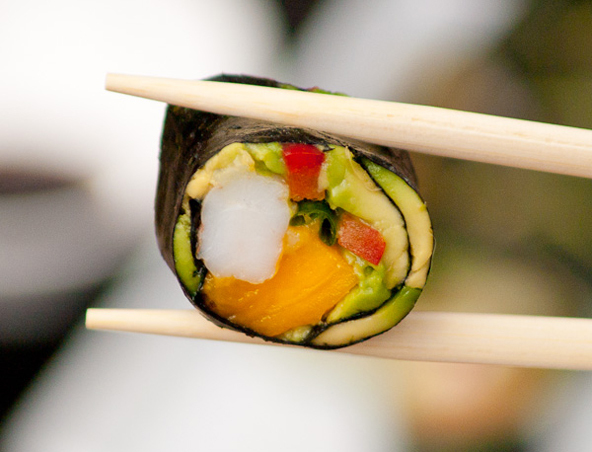 It doesn’t need to cover it completely—just enough to help seal the roll and soften the nori. Repeat with all four nori sheets. Mango-Shrimp Rolls: Place half the shrimp on the bare strip of nori closest to you and top them with a few of the scallion greens. Place a parallel stripe of mango on the far side front of the shrimp, and add a few strips of red pepper on top of the mango. Time to roll. Starting at the end closest to you, take a deep breath and roll the sushi, using the mat to help you tuck the ingredients into the roll. When you get to the end, give it a gentle squeeze to help the avocado do its job. Repeat with the remaining shrimp and another sheet of nori. Avocado-Shrimp Rolls: Place half the salmon on the bare strip of nori closest to you and top it with a few of the scallion greens. Place a parallel strip of jicama in front of the salmon, and add a few matchsticks of cucumber on top of the jicama. Roll, starting with the end closest to you, then repeat with the remaining salmon and remaining sheet of nori. Slice & Serve: Run a sharp knife under water and shake to remove the excess. Slice the roll crosswise into rounds about 1 inch thick and arrange on a plate, along with the remaining vegetables to eat on the side. If you’re dipping, add some coconut aminos to your wasabi and dig in. OMG! You have just made my day! I think I could actually make this!!! Hmm,for the other veggie,maybe shredded carrot?? What are your favs?? BTW: Would love demos of your other favorite combos!! Anton –> Let me know if you make 'em and how it goes! Trixie –> Shredded carrot would be great inside the rolls. The "other veggie" listed in the ingredients is a whole serving of veggies eaten alongside the rolls to make sure you get enough veggies in the meal. I"m not sure you could put enough shredded carrots INSIDE the roll to count as a veggie serving. But try it! And it if works, I want to see a photo! I use cooked shredded cauliflower as the rice. works awesome. Lemuel –> That's a great idea! I use cauliflower as a rice replacement UNDER curries and stir-fries… love the idea of including it in the sushi rolls, too. I"ll have to try that next time! Yeah for Coconut Aminos!!! Thanks for the tip/new find! We have this really great sushi place that makes us all sorts of riceless rolls (just fish, veggies, and nori…YUM! ), but I struggle with the no soy sauce thing…I actually limit myself to 1T. Not ideal, but better than a big ol' bowl of it. I'm definitely taking my bottle of coconut aminos (I finally found some today at Natural Grocer) with me next time! I like my rolls with salmon, sambal, cucumber, avocado, and those little fish eggs. The sushi place we go to makes us a roll with spicy tuna (tuna and sambal) and cucumber inside, wrapped with nori, and spicy salmon on top…no rice needed. So good!!! Jen! Glad you got the coconut aminos. They really have opened up some previously-closed food doors. It's awesome. That spicy tuna roll sounds really good. I think I'm going to get a bamboo matt and start experimenting more! Sounds great. Not to split hairs but rice has been a staple going back as far as 2500BC. I'm guessing a fair amount of the Asian population would disagree that rice is poison. If you dip your finger into a bowl of Rice Vinegar (is this Paleo?) and run it along the edge of your nori it will also seal it up BETTER than glue! Thanks for the tip… sadly, rice vinegar is NOT paleo. Stupid grains! I'm sure a little water would do the same trick! However, I did try the above tip to use a wet knife, and it worked great to cut the sushi into rolls. Just made these for dinner, they were soo amazing, I wish i had more! My husband loved them too! just wondering who makes the coconut aminos? is it by Bragg’s? The ones I use are from Coconut Secret. I don’t think Bragg’s makes them. These are pretty tasty — and really fun, too. Congrats on your paleo commitment. Be sure to let me know how you’re doing! Looks delicious, why didn’t I think of using edible glue? Im going to try making with sliced red and yellow peppers for colour, and chop the shrimp with a tin of crab meat (food processor for the win!) to ensure that the shrimps do not suffer the same fate as the avocado once did, getting trapped in one bit and not another. I LOVE all your ideas. Having fun playing with it — and eating! YUM! I was JUST thinking how much I wanted paleo-friendly sushi, and figured I’d have to make it myself! However, while I was researching the subject, I found out that faux crab meat is not paleo friendly, wheat is used in the processing of it, so use the real deal! Dear Mel, I don’t know why it took so long for me to stumble upon you here. You have saved my poor life! I’m glad you found me! Welcome! This is not sushi. Contrary to the commonly held American belief, sushi is DEFINED by the rice preparation, not by the raw fish element that some sushi features. And, while I do get the point behind some choices of the “Paleo-diet” fad, I’m certain that most Eastern cultures would argue with you on the point that rice is “poison” since most of them have a longer average life expectancy than many Western cultures despite rice being a staple. OK, well… call it something else then, I have nothing against that. What you say is correct. Sushi is about the rice. Thrilled to find this recipe! I am also of Asian descent and need to find diabetic friendly recipes. This should meet the “sushi” cravings. Gonna try the coconut amino acids too. I make riceless sushi whenever I have dinner at home… aka; I wrap EVERYTHING in nori! ha ha. I love salmon, spaghetti squash, spinach & green beans! So delish! Hi, Melissa! I love your personality! And I love your recipes, ideas, and no-nonsense work ethic. I have noticed one thing about Paleo people: They are in an inherently perpetual good mood. I am new at Paleo, but have already lost 25 pounds and I feel wonderful, too. Please keep up the great website. Thank you so much! Congratulations on making the switch to paleo and on your weight loss… awesome! I just made these…mmmm. We have a winner! while i read thru the recipe, i thought that i could make a cauliflower rice and bind it with egg to make it like the rice.just a thought! Well I found out the hard way that storing these like I commonly store sushi rolls is not a good idea. I typically make up my sushi rolls in the afternoon and wrap them in plastic and store in the fridge for a few hours until dinner. Then cut and serve. I think these might need to be eaten right away or skip the plastic wrap! The plastic made the whole thing sweat and made the nori really wet. I have never had that problem using rice. That being sad, my sushi loving kids ate them up! I used leftover tuna fish, avocado and veggies from lunch. They didn’t eat much at lunch but they inhaled the “sushi”. Thanks for the great idea. Also you can add strips or whole egg crepe to this. Just whip one egg with a couple of drops of water at a time for each roll and add a bit of water. Cook like a thin crepe. slice lenghth wise or use the whole sheet on top of the ingredients and roll as indicated. Extra protein and texture. Also try roasting the nori sheet by passing in over the open flame to make it a bit dry (not to crack when you roll them but enough to make it a bit dry). This is a great snack for when you are running around at night looking for a friendly snack! Thank you! This is the first of your recipes I’ve tried (new to Paleo!). These were so so good. The shrimp-mango was my favorite. I can tell these are going to be a new staple around here. Can’t wait to try more of your stuff! Congratulations on joining Team Paleo 🙂 Glad you like this recipe! Wishing you many more delicious paleo meals. Happy cooking! Yum! That sounds so good! Glad you had fun experimenting — thanks for sharing! slice the avocado thinner and spread it out! brilliant! i’ve been craving sushi since my 2nd trimester started and it was the one dish i would ‘cheat’ and eat white rice in, but it would hurt me the next day (i react to most grains w/ inflammation and achy joints)- but then started rolling just veggies in nori and eating that w/ wasabi and aminos. AAAAAH! so delicious. tonight it was just avocado, carrots, cucumber and pickled ginger, but i realized i needed to look up some recipes to get tips on rolling them better and ended up here (after 10-20 sites) and loved these recipes! looks like more sushi nights and jicama and salmon joining the party. gluten-free since 2001, grain-free since 2011 (w/ sushi roll cheats)- and had to embrace that i might be what they now call paleo. Thank you and off to explore your site! Hi There, I love the idea of no rice however, you mentioned that “Dave is allergic to fish”….how is it that you have salmon in your roll??? I happen to be highly allergic to fish myself & find it very challenging eating @ a sushi joint…. thus, I DON’T. You couldn’t get Dave within 100 feet of sushi. I make sushi and other fish for myself when he’s not home. BUT… if you want to make this sushi for yourself, replace the salmon and shrimp with cooked steak or chicken, then dip in coconut aminos + wasabi. Then you get the experience and delicious taste without the fish. I have both a rice and soy allergy. So I have never tried sushi!!!! If I even walk into a place I start to feel all itchy. This is a perfect alternative for me. My daughter saw this and posted on my FB page. Thank you so much! I will give this a try! I am so incredibly excited to make this! I’m having a sushi birthday party for my boyfriend tomorrow and have been trying to figure out the best way to make grain free sushi, loving the idea of avocado spread and also caulirice for a rice sub! So very eager to see how everything turns out. Thanks for your amazing ideas, books and recipes! Have SO MUCH FUN! Let me know how it turns out! Wow! I just recently wrote a post “Paleo Sushi Night” which was the first time my husband and I ever made sushi at home and it was so much fun!! We had trouble getting the nori wrap to close and we ended up using avocado too. I wanted to read how you did your sushi and it seems you had the same idea. I’m going to have to come back here when we make sushi again. Thanks for the post! !